SUMMARY: Attempts to solve seven famous mysteries from the past using 21st Century forensic science. Mysteries surrounding famous historical figures such as King Tut, Louis XVII, Princess Anastasia, Napoleon, and The Man in the Iron Mask are examined in-depth in order to speculate what might have happened to them. Overall: 5/5--My middle schoolers are going to love this book! I am constantly on the lookout for "middle school appropriate" crime nonfiction. That can sometimes be a tall order since what my students really want is sensationalized serial killer stuff, which tends to be written for adults. I loved the stories of King Tut, The Man in the Iron Mask, and Princess Anastasia especially. While some of the stories end with no real answer to the mystery, other answers become evident only through the forensic tests on the bodies. I loved that some of the questions were not answered--it goes to show that even with all the science we have today, we still don't know everything. It leaves some things still up to the imagination! Presentation & layout: 5/5--Contains lots of captions, information boxes, clean layout with lots of negative space, title page of each subsection is a bright blue background marked with crime scene tape, headers highlighted in bright yellow make them stand out. Some pages present the information as if it were on a computer, tablet, or smart phone screen. Quality of information: 5/5--Each story is thoroughly researched. Presents lots of interesting historical and scientific information in a clear, easy-to-read format. Photos/illustrations: 5/5--Includes lots of full-color photos, maps, paintings, and x-rays. Excellent layout, and all photos include captions on orange "evidence identification" tags. Documentation of sources: 5/5--Huge bibliography, broken down by each of the seven featured mysteries. Front and back matter: 5/5--Contains TOC, Acknowledgements, glossary, Royals Time Line, Forensics Time Line, bibliography, further reading, image credits, and index. Engrossing: 5/5--Each story integrates background historical information as if it were a story. The mystery in each section is clearly identified, as are possible explanations for the mystery. Each possible solution is explained clearly, and evidence supporting or discounting each possible answer is thoroughly examined. Writing: 5/5--Writing is clear and engaging. Forensic terminology is easy-to-understand, so middle school readers should not have any difficulty understanding what is going on. Appeal to teens: 5/5-- Teens are interested in forensic science, especially when there is a mystery to solve. This is a current topic that will appeal to students who watch TV's Bones or HBO's Dexter. Appropriate length: 5/5--Each story runs approximately 20 pages, and nearly every page features at least one full-color illustration. There is lots of negative space on each page, making the book easy on the eyes. THE BOTTOM LINE: A must-have for middle school libraries and science classrooms. Other: Sensitive students may not like frank discussion of bugs that inhabit dead bodies, mummies, rigor mortis, etc. 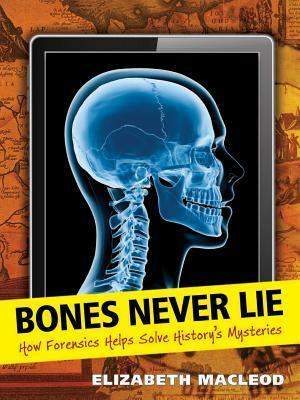 Thanks so much for such a great review of my book, Bones Never Lie. I'm delighted to hear that you think your readers will love it -- I had so much fun writing this book and learned so much too!